12-strand Silk Floss is a spun silk thread with silk's beauty, luster, and shine, but doesn't catch on your hands. 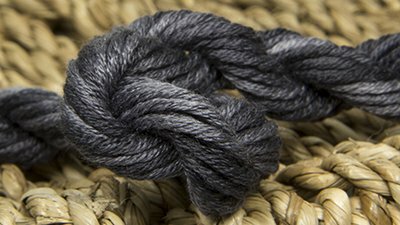 The size of one strand is comparable to other stranded silks, such as Splendor, Soie Cristale, and Needlepoint Inc. Silk. Gloriana Silk is soft and remarkably easy to stitch with. Gloriana silks are washable in cold water; washing instructions are on our new labels. In case the label doesn't have washing information, it is as follows: wash quickly with mild soap (such as Orvus), rinse thoroughly, and blot out all excess moisture immediately. Be sure that the rinse water runs clear before drying. Iron the piece dry using a warm, dry iron (do not use steam) placing the embroidery right side down on a clean, dry terry cloth towel and covering the wrong side with a pressing cloth. If, as you iron, you see any sign of color bleeding rinse the piece immediately and start the drying process over again. Do not leave the piece to dry overnight since it would mean you won't be around if any last moisture escaping causes color bleeding.